Onboard entertainment is an important must-have for many consumers, but can be a complex and costly commitment. We offer transportation businesses a range of modular solutions to streamline premium video delivery workflows through our content processing, DRM licensing, and player technologies. Video Toolkit enables low-cost video content processing in the cloud to quickly and securely prepare MPEG-DASH and HLS media assets for passenger playback. Discover our DRMtoday Onboard digital rights management (DRM) local licensing server with a small hardware footprint to enable secured studio content across all screens. 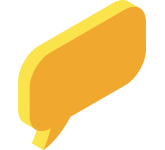 We provide PRESTOplay SDKs for protected media playback across browsers, tablets, phones, and laptops. Our flexible video player solutions are packed with rich features for bring-your-own-device (BYOD) or onboard screen environments. Offer a fully browser-based playback solution for laptop and mobile devices (including iOS/Safari with FairPlay Streaming DRM). Offer branded standalone player applications for Android, iOS, Windows, and macOS. Option for passengers to take designated content with them via secure downloading and local playback. Before media can be loaded onto an aircraft’s server for viewing, it must first be encoded, encrypted, and packaged into a deliverable format. 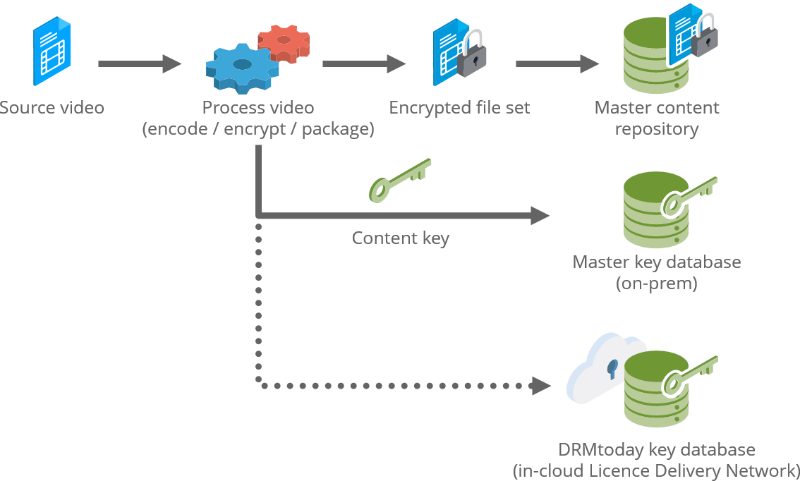 During this process, content keys are securely ingested into a master database. Optionally, keys can also be securely ingested into our cloud-based DRMtoday License Delivery Network for internet-enabled use-cases (for example: to extend viewing after a journey ends). We supply a fast and automated content preparation process through our Video Toolkit cloud service. 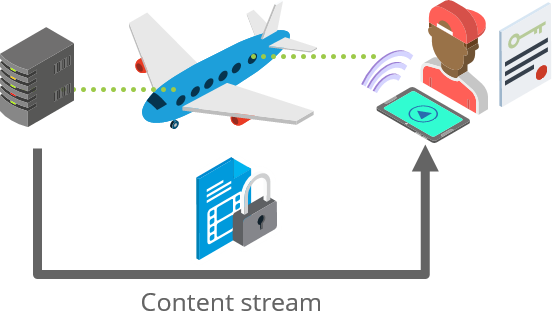 Encrypted content and relevant license data is then safely loaded on the plane’s onboard streaming server. Securely transferring assets onboard is an important security consideration. Our DRMtoday Onboard solution supports different safe content loading and key scenarios including network sync, physical transfer, as well as dynamic key generation. 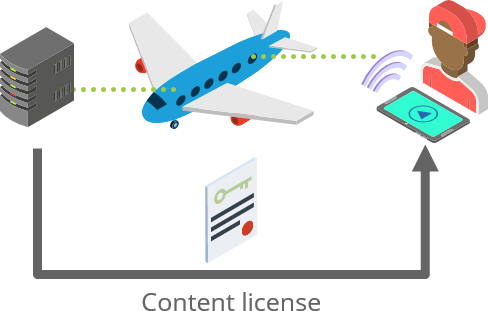 When a passenger requests playback, an onboard DRM service prepares and delivers the appropriate license for the DRM system used by the playback application (PlayReady, Widevine, or FairPlay Streaming). Our comprehensive DRMtoday Onboard server technology securely manages multi-DRM licensing for studio content across all screens. The player application then decrypts the MPEG-DASH or HLS content on the passenger’s device for streaming to begin. 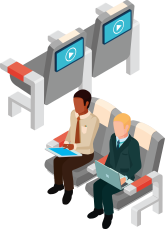 We offer robust PRESTOplay SDKs to achieve simplified player development for passenger devices. We provide professional services for integration, system development, synchronization process design, testing and more. 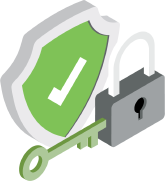 Our experts can also assist you with technical documenting of your DRM workflow to help complete studio security checks when obtaining content. Changes in technology and consumer expectations create unique challenges for in-flight entertainment. To ensure we continually meet the airline industry’s needs we are a member of the Airline Passenger Experience Association (APEX). Contact us to learn more about how we can provide you with comprehensive transportation entertainment solutions.